The characters in this story would all be speaking in Gaelic. Though they tend to speak English when David is around (and at a much later point will speak it more often) Gaelic will be the language these characters tend to use most amongst themselves. This is just a Christmas short, though it is set for on the day or so before Winter Solstice. Light glinted off of the fir presiding over the corner, near the place that the kelpie liked to paint the portraits of those he once held dear. That danced on the strange silver strands that had been hung so carefully – and with tears – by the male head of household. Dark hair fell loose over the red velveteen and green dress of the female household head, her head bowed slightly as she looked at the ornament in her hand. Paddle-waddling closer and stretching up, the little brown selkie pup could see that the light from the fireplace glinted off of this too, and a teardrop likewise caught the light as it fell. “I miss our baby.” Whispered the teardrop, speaking to the water pooled in the darkened eyes of the male house head. “I miss her, Finnol... I never realized how soon it would be that she'd be gone for the Winter Days...” echoed the woman the tear had fallen from. The water gathered in the man's eyes agreed as it too slowly spilled. The selkie pup paddle-waddled close enough to lay his side against her ankle, trying to imitate what his mother would do when he felt sorrow. Above him, the woman's mate placed his arms around her and drew her close. Etain buried her face in Finnol's shoulder. The white sailor's blouse darkened with the wet smeared onto him. Clutched in his hand, another ornament caught the light, and the fire crackled loudly when the greenish water-horse in the corner went to kick in an oak log. Banu strained to make out, past their fingers, what these ornaments actually were. One little white seal was clutched in Etain's hand, a little brown one in Finnol's. The selkie pup nuzzled their ankles lightly. His mother quietly continued hanging the garlands of seaweed, pine needles, and ribbon while their hosts held their breath under control and the salt of their tears made the room pungent. After a moment, he moved away, then wriggled out of his skin, just as human seeming as the pair. Once securing it around his waist, he peeked into the boxes the strange trappings were in. He saw seashells of various sorts on hooks, and little glass things of fanciful shape that he knew could never have been made below the sea. In the box that their hosts had made plain that only they were allowed to hang, he saw ten more of the seal ornaments. A few were black, most were brown. Of the twelve he had seen in total, only the one Etain currently held was white. Most of these were small, and only two were adult seals. Banu left that box, and from the box of shells he carefully took and hung what he felt sure his chubby little hands would not drop and break. His brown eyes questioningly sought his mother's. The tall woman, clad in borrowed clothing, pressed her lips tight and pulled him into a fierce hug, garland still in one hand. After a moment, Etain and Finnol began humming a quiet lullaby, which gradually rose into song as they released each other and began to hang the seals. With each seal hung, a name was woven into the lyrics. The silence fell then, Etain and Finnol once more holding each other and leaning against each other, and this silence allowed the wash of the waves of the high tide to be heard where the house sat on the bluff. The silence lasted, warm and sorrowfully gladdened, till broken by a voice above the mantle. “Byron... can you hang my pearls, please...?” The soft, low voice of a brown selkie, half out of her skin, came from the portrait that had been Enlivened so long ago, after her Passing. The kelpie reverently dipped his muzzle into the box, the heat of the fire evaporating the water that dripped from him constantly. When he emerged, clenched carefully in his teeth were three pearls, strung on blue thread from North Sea hippocampus wool, surrounded by beads of bone and local stone... once a necklace. 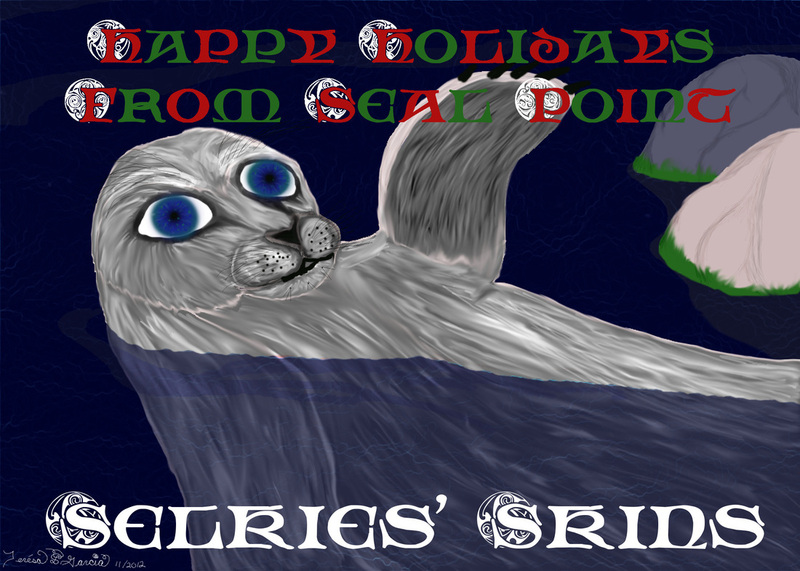 Softly, he hung this as high up the tree as he could, and the selkie in the portrait sighed, remembering a time long ago. Banu's mother hummed a song low, before breaking into a song she once heard some sailors singing, around the same season. The breeze, the Holy Ghost. O blessed be the babe! Must follow to the cross. Which unto him was given. Banu listened to the songs quietly for a span, punctuated by the crackling of the fire. The adults settled, while Olan and Connor, the two males currently competing for his mother's affection, put their touch on the tree by decorating it with some phosphor-balls. “I don't understand...” His voice cut in, small and soft. “Why do you do this?” He asked Etain and Finnol. “Ourselves and our children. Though our pups are not here, they are still under the tree this way. No matter where they are or what they might be.” Finnol sighed. Etain and Finnol smiled at each other thoughtfully. His mother nodded in agreement with her son. “Well, we'll think of something...” Finnol smiled. All eyes, whether half or full selkie, or kelpie, or those of the deceased, turned contemplatively to the tree.